More than ‘just’ a photobooth. Hello! We are Snaptured Photobooth and we pride ourselves in providing the ultimate Photobooth experience. We create the ultimate platform through the latest technology to showcase your special occasion. We are more than ‘just’ a photobooth. 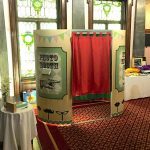 Snaptured Photobooth provide 2 booths – the first is our Original Snaptured booth and the other is our beautiful Vintage style booth – especially suited for your BIG Day! We can also arrange for a personalised booth cover so that you can use a chosen design for the front of your booth. Please contact us to discuss this option. This will definitely capture your audience! To learn more about our booths, scroll down for our features and their details. Learn exactly what our booths can do for you! Getting married? Snaptured offer the unique and entertaining service of Marryoke. We will record you and your guests singing along to a popular song then make a montage of all the clips. Imagine the many laughs that you and your guests will have reliving the daring (or maybe dodgy) dance moves and singing from your event! If you’re looking for that something to make your wedding stand out and to give your guests a good giggle – then look no further! Book our Marryoke booth! Everyone loves to dress up a bit with the fun props in a photo booth. With our new technology now you can take things to a whole new level with our new digital facial recognition photo booth props. Using the latest facial recognition technology our latest photobooth software will recognise the faces of people in your booth and give them the option to apply a wide variety of digital props on, above or to the side of their faces. Props can range from full or half masks, hats & wigs, cartoon mouths or eyes, speech bubbles and many many more different types of prop. You are only limited by your imagination! All Snaptured photobooths offer the Video Messaging Service. This comes free with every Snaptured photobooth hire. Your guest can enjoy leaving messages or even sing you a song. All videos will be given to the event organiser or designated person at the end of the night on a USB or can be delivered post event on DVD. Be prepared to watch your videos back and go through an abundance of emotions reliving your big day! All Snaptured PhotoBooths provides Social Share. This enables you to instantly share and upload your photos and videos to social media. Whether you’re having a party, wedding or corporate event we are able to instantly share and upload your photos with our secure Snaptured social sharing app. This app is created in line with Facebook, Twitter and Instagram making it a great way to upload those happy moments with others instantly. We live in a twitterverse where the use of #hashtag is the ultimate way to gain maximum publicity for your event. Hashtag Printing is a new and innovative way to access all images taken at an event. We are able to instantly print photos taken from any mobile device by using a hashtag of your choice chosen for your event. These photos can be directly accessed through one of our print stations and we are able to incorporate any branding/logos you may chose. This is a great way to gain company/brand exposure, with the option to share the images instantly through our Social Sharing App also. All our booths come with an interactive touch screen inside. You can select portrait, group shot, green screen or Video messaging. Our touchscreen is an electronic visual display that the user can control by simply touching the screen. The user can use the touchscreen to react to what is displayed and control whether they record a video, take a group photo, portraits, or green screen shots. Snaptured link an external monitor to our booths. This will create a slide show of all the pictures taken inside the booth. This can be requested as an extra at no extra cost! Interactive green screen. This allows us to put any background where you would normally see a curtain. Before your event, Snaptured will discuss which backgrounds you would like to feature in your photobooth. This feature is also brilliant for corporate product launches and advertising for businesses. With the Snaptured dream machine feature we can bring the beach to the booth from your wedding holiday and maybe a famous person you have always wanted to be pictured with. We can take your guests around the world in a photobooth – the possibilities are endless. Just use your imagination and we will do the rest. Around The World: Travel to the 7 continents of the world with beautifully themed green screen sets including Europe, Africa and America. 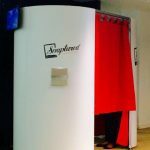 Snaptured photobooths have the technology to run live events. What this means is that all images will upload to our website gallery the moment the picture is taken. Guests can then access the pictures and upload to their Facebook accounts. Snaptured photobooths have the technology to run live events. The booths incorporate the key Instagram filters. Guests can then view photos on Instagram using the proposed hashtag. Snaptured flipbooks are made on site from a short video of your guests that we film against our backdrop. The entire process only takes around 90 seconds and at the end they get to go away with a 40 page book that when flipped plays the video of them! Flipbooks are great at any event for your guests to go away with a little souvenir or wedding favour. Think of the fun that can be had by using these as favours at a wedding or Barmitzvah with your names and date on them. Or think of what a great impression you’ll make with your potential clients at a trade show or product launch especially with a custom branded flipbook! Everyone loves to have something personal and unique to them rather than a generic gift and it’s guaranteed they won’t throw it away as it stars them. Software: Every Snaptured photobooths benefits from the most up to date Apple Mac Software producing the best results every time. Camera: Photographs are taken with either a Cannon DSLR camera or a 1080p HD webcam. Every Snaptured photobooths also incorporates photographer quality lighting, which provides high resolution and enhanced photographs. Printers: Every Snaptured photobooth has installed a high calibre dye sublimation printer. This ensures high resolution photographs that are exceptionally clear and touch dry as soon as they come out of the printer. Once you have taken your picture they will be available instantly touch dry. We can even provide double copies if you would like them for a personalised scrapbook or to have spares!